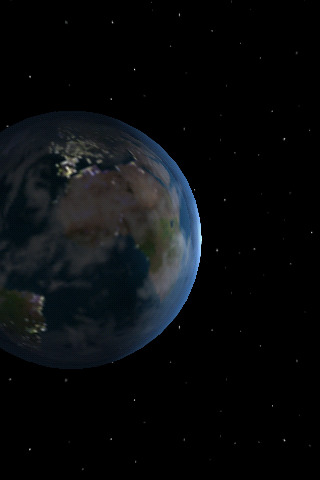 When you open Earth3D you will get a 3rd person view of the Earth as it spins. 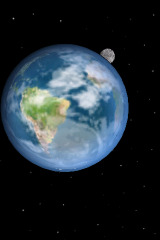 As it spins you will also see the moon and sun in their respective positions. I can’t tell if the position of the moon and sun change based on the time or not. It would be really sweet if they did. 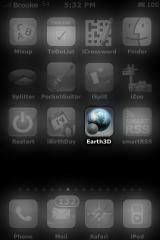 If you just sit and watch this app, it moves very smoothly. However, if you try to drag your finger on the screen it gets glitchy. 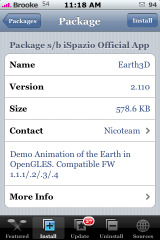 Earth3D is available through the iSpazio source. Keep reading for screenshots! Every time I open the app it just crashes. Has anyone else had this problem? Does anyone know why? Works fine for me. Nice app, also uses the accelerometer. Tilt iphone sideways and you get a better view. Dragging the earth lets you change the rotation either way but a little choppy. Didn’t work for me! (firmware 1.1.3) Every time I open the app it just crashes. Has anyone else had this problem? Does anyone know why? 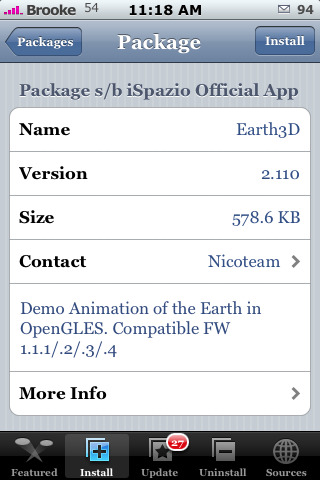 i cant even find the app…i keep adding iSpazio source from the sources but installer wont recognize it!! what should i do?? Man guys…talk about a lot of crashing!! I have no idea why it would be doing that…I have used it a few times with no issues!